The guys at Anglim’s Western Metal Work know that not every job can be completed in the welding shop. When your needs require an on-site solution, we’re here for you. From field welding on an agricultural job to on-site construction and welding repair, we’re fully equipped to handle your welding needs on the go with our full-service mobile welding unit. Before we settled in our current location, we got our start as a mobile welding service – and we’re still available for field welding and repair throughout the state. Our mobile unit is fitted with the tools and technology required to complete most welding jobs, including aluminum and stainless steel welding. If a job cannot be completed on-site, we will work on it in our shop, fabricating the necessary components and returning to install them. Do you have a welding job that needs to be completed? Contact us for more information about our services or to request a free quote for the work. We’ll be happy to answer your questions to help you decide if we’re the right fit for your metalworking needs. 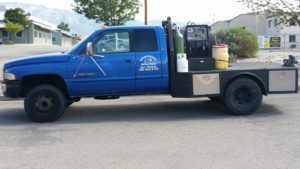 Call 505.822.9170 to schedule mobile welding service today.